Can you believe that I had French toast only once or twice while growing up? One day I ate it at a friends’ house which prompted me to ask my mom to make me some. Which she did, once or twice. 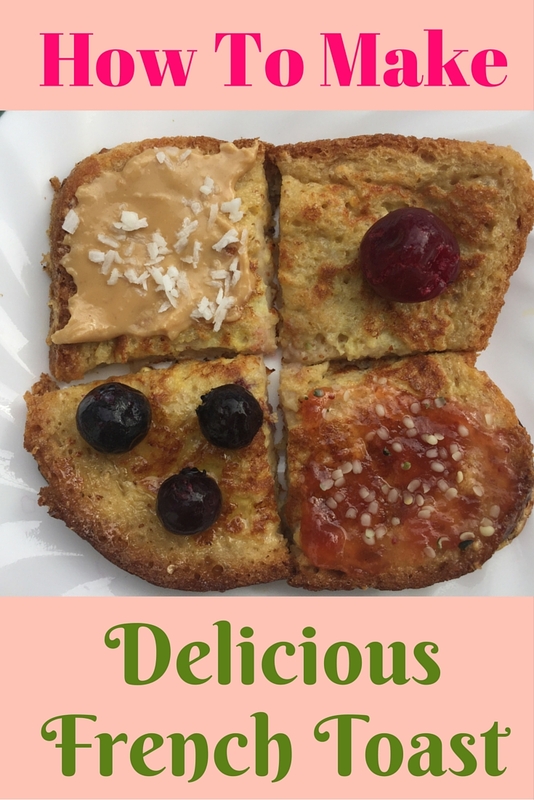 It seems that history repeats as I made French Toast for my son only a couple of times since he was born and I have never made it for my daughter. So I decided to end the tradition and include French toast in our snack and breakfast rotation. This is my spin on French toast. My whole family loves it. If we spread nut butter on top (we love almond butter and cashew butter), hemp seeds, and fresh berries, then it is a breakfast meal for us. If we drizzle maple syrup and sprinkle coconut flakes, then it’s a snack, as I try to avoid giving my children sweet foods for breakfast. Heat a frying pan on medium heat until hot and add the coconut oil to the pan. Whisk the egg in a wide bowl. Whisk the milk and vanilla together in another wide bowl. Dip one bread slice in the egg until fully coated. Then dip the slice in the milk mixture. Place the slice in a hot frying pan. Repeat with the other 3 slices. Cook each slice for about three minutes, until one side is golden brown and then turn and cook the other side until golden brown. Remove the bread slices from the frying pan and place on a plate. What are your family’s favourite French toast toppings?